There are gads of companies distributing artist's music to digital stores like iTunes, Rhapsody and Amazon.com MP3 these days. But for me, the #1 company to sign up with to distribute your music online has always been CD Baby. They were the first to offer digital distribution for independent artists and they have consistently been the best at it, as far as I have been able to tell. As a CD Baby artist myself, I can tell you that I have been enjoying getting my digital sales bank deposits every week. Most months I do about $1500 in digital distribution sales. That's a nice chunk of change and frankly, it's about the easiest money I make every month. There are other alternatives to CD Baby, however, for musicians who want other options. The most prominant of those is TuneCore, who just paid their artists over a million bucks for digital distribution last January. One artist, Josh Kelly, is among the most successful. He earned $135,000 in a month. Now THAT is a nice chunk of change. IndieKazoo is a very clever, easy-to-use "web store" add-on tool for your web site. Create your own personal music store, sell your own music (CDs and/or downloads) directly to your fans and receive 100% of your sales revenue. Sales go directly and instantly to your PayPal account. It's an easy setup, and you are only charged a flat-rate of $20/month. Pay-as-you-go, no contract, cancel at any time. You can sign up for a free 30 day trial to try it out. The store integrates seamlessly between your own web site and PayPal. 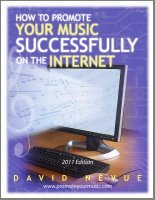 It's a great option for those of you who would rather not send your visitor traffic to iTunes to purchase and download music. Also, it's a great alternative for those who don't want to bother setting up their own merchant account or buying expensive shopping cart software to sell their music online.